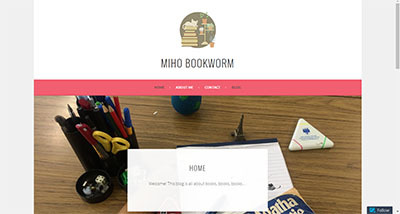 GHIS Web Design Student Portfolio - M.K. Portfolio of Student Profile M.K. This is the first website I have created. The website is about my cats - my favourite subject! It was fun choosing which picture of my cats to use (I have tons of them!). 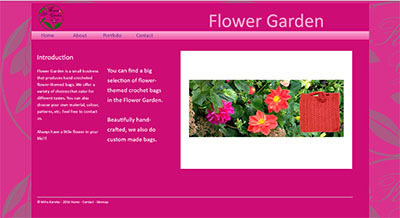 Even though I think I have gained much knowledge in coding, it was still challenging to create a website from scratch. Nontheless, I thoroughly enjoyed the experience! This is the second website I have created. The website is about the fictional business I set up as part of the Digital Media Technology module. I also created the logo for the business. I don't usually go for pink but this time the colour scheme worked really well! This is the blog I created using WordPress. The blog is suppsoed to review the books I've read. I used the sleeping-cat-on-the-books design I created using Adobe Illustrator as my logo. The photo used in the header was taken by me: it shows one of Agatha Christie's books - my favourite author!